NEW YORK; May 10, 2017 – The Class of 2017, the first crop of Generation Z (people born between 1993 and 1999) to enter the workforce, is more interested in working for large companies compared to last year’s grads (19 percent vs. 14 percent), according to a new study by Accenture Strategy on the future workforce. New graduates desire an engaging employee experience and want to take full advantage of their degree. 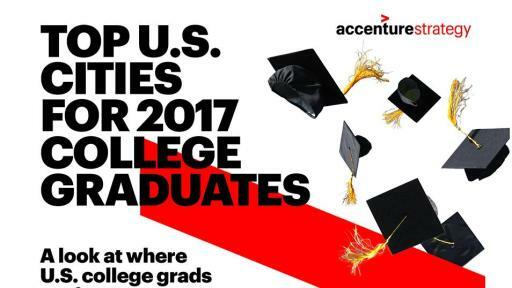 The fifth annual Accenture Strategy 2017 U.S. College Graduate Employment Study also found that this generation is more prepared to enter the workforce and desires in-person interaction. For the first time in years, there’s an uptick in the number of graduates wanting to work for large companies. New grads expect full-time employment in their field of study (71 percent) and expect to have on-the-job training (67 percent), shadowing (48 percent) or formal training (49 percent) in their first job. While they have high expectations, new grads are entering the workforce prepared to land these opportunities. Eighty-eight percent of new grads considered job availability before selecting a major, and most are showing a desire to enter fields with room for long-term growth. STEM was the most popular major this year – up seven percentage points compared to last year (30 percent vs. 23 percent). Additionally, more new grads who completed an internship, apprenticeship or co-op saw it lead to a job post-graduation compared to last year (67 percent vs. 45 percent). New entrants to the job market are also flexible and loyal. Seventy-five percent of new grads are willing to relocate to a different state for the right job – and it’s likely they’ll have to. For 2017 graduates, the current economy will likely have them looking in a different city for a job (41 percent), commuting farther (38 percent), and/or accepting the first offer they receive (38 percent). After landing a job, most 2017 grads (62 percent) expect to stay at their first job for at least three years. While new graduates are prepared to enter the workforce, their expectations of the future do not line up with the reality experienced by recent graduates currently in the workforce. This is largely evident when considering salary. Salary expectations are ambitious for the 2017 grads compared to actual salaries of recent graduates. Sixty-nine percent of 2017 grads expect to make more than $35,000, but only 49 percent of 2015/16 grads do. This is up for both groups from last year: 56 percent of 2016 grads expected to make more than $35,000, but only 33 percent of 2014/15 grads did. Despite the optimism of new grads, underemployment continues to rise, with 54 percent of recent grads feeling they are in a job that doesn’t require their college degree. This is a steady increase of 13 percentage points over the past four years. In the workplace, two-thirds of grads (66 percent) welcome Artificial Intelligence (AI) and other advanced technologies, believing they will enhance their work experience. However, face-to-face is the preferred way to interact with colleagues (42 percent) followed by web tools (21 percent), email (15 percent) and social media (10 percent). Nearly three-quarters of new grads (73 percent) have taken digital, coding or computer science-related courses in college. However, most feel they need to improve their problem solving (52 percent) and communications (50 percent) skills to be more attractive to their employer. 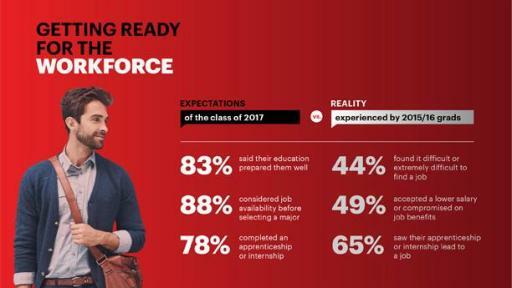 The Accenture 2017 U.S. College Graduate Employment Study surveyed 1,000 students who will be graduating from college in 2017, and 1,000 students who graduated from college in 2015 and 2016, to compare the perceptions of students preparing to enter the job market with the experiences of recent grads already in the workforce. All respondents are between 18 and 24 years old. 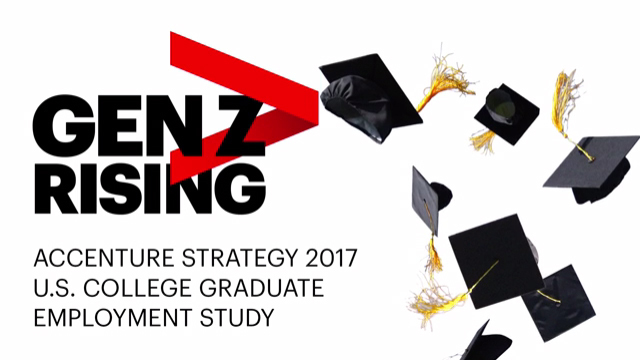 For more information on the study please visit: http://www.accenture.com/US2017Grads. Accenture (NYSE: ACN) is a leading global professional services company, providing a broad range of services and solutions in strategy, consulting, digital, technology and operations. Combining unmatched experience and specialized skills across more than 40 industries and all business functions – underpinned by the world’s largest delivery network – Accenture works at the intersection of business and technology to help clients improve their performance and create sustainable value for their stakeholders. With more than 401,000 people serving clients in more than 120 countries, Accenture drives innovation to improve the way the world works and lives. Visit us at www.accenture.com.